A colourless impregnating sealer for polished marble, porcelain and granite. It has a completely natural finish and is suitable for wall and floor surfaces, both internally and externally. Strongly protects against water, oil, grease and dirt. 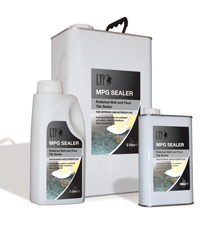 Maintain surfaces with LTP Waxwash and LTP Stonewash for walls and worktops. More detail on these product can be found at www.ltp-online.co.uk. Coverage: 1 litre = 15m2 on a low porosity stone, or 7m2 on a medium porosity stone. Click here for Technical Specification Sheet on this product.